Range Rover Velar – Car Review. It's the current Range Rover to be seen in, and Liam Bird thinks it does everything you'd expect, despite limited rear seat space - but is the all digital dashboard a step too far? Velar. You pronounce it Vel-ar. It’s derived from the latin velare meaning to veil or cover and it was the name Land Rover engineers gave to the 26 original pre-production Range Rovers back in 1969 in a bid to hide their true identity. Those, say the Land Rover PR types of today, “were the pioneers of the luxury SUV landscape”. In the sixties no one really knew what an SUV was. Now though, they’re everywhere, and the market keeps on growing. 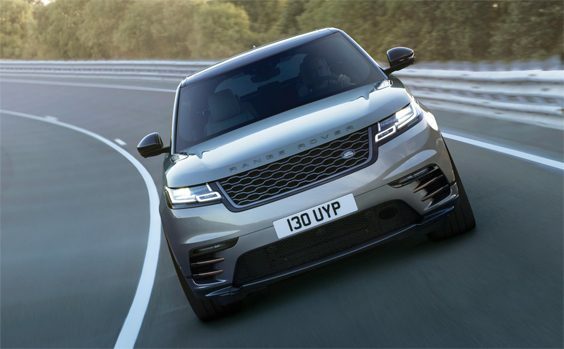 Land Rover know this of course – it’s their bread and butter – and that’s why they designed the Velar to slot nicely into their current line-up, between the smaller Evoque and the altogether beefier Range Rover Sport. Well, I say Land Rover. The Velar’s design is actually the work of Gerry McGovern, Land Rover’s Chief Design Officer; the man who was recently named Designer of the Year at the Festival Automobile International. The “Masterpiece” Velar SUV was singled out for praise by an international jury of experts. 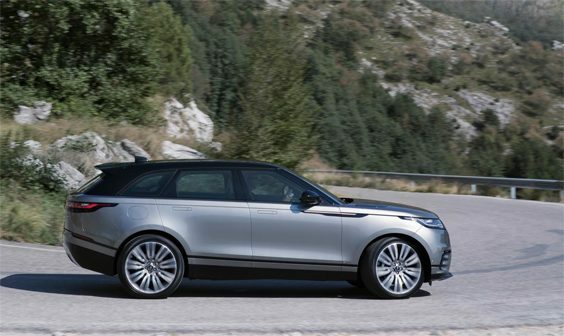 I lay no claim to being a design expert myself, but what I do know is, that in the metal, the Velar’s shape, like a lot of recent McGovern designed Land Rovers, is very colour sensitive. It also works far better when fitted with bigger wheels – you can spec 22 inch rims if you’ve the funds. From some angles it really does look striking, whereas from others, well… Beauty perhaps is in the eye the beholder. Those opinion-splitting looks are a result of what’s been described as “an unwavering belief in ‘reductionism’”. In reality what that means is a very clean, very sleek shape. The door handles fold flush with the rest of the body and the headlights are super-slim Matrix Laser-LEDs. The Velar is the super-stylish Range Rover, the most road-orientated one to date. It’s a rakish 5-door SUV with near concept-car looks; the kind of thing you park outside one of those near all-glass houses that hopelessly handsome linen-suited people who annoyingly collect no clutter at all build on Grand Designs. Like them, the Velar is altogether more “urban” than its muddy-booted siblings. Or at least, I think, that was the idea. The reality is the Velar feels very much like you’d expect a Range Rover to feel. We sampled the 300bhp V6 diesel, which, unsurprisingly, provided more than ample shove. When coupled to Land Rover’s 8-speed automatic gearbox, near silky-smooth power delivery, 0-62 mph is said to be attainable in 6.2 seconds, or if driven carefully, 44.1 Mpg is said to be the average. Five-up on a Monday morning’s dash-and-back to Chester we got 33.4. On its air-suspension – all V6 Velars get air, 4-cylindered cars get springs – the ride was trademark wafty without being too rolly, and when a swift change of direction was required the Velar responded readily and with little complaint. If only the same could be said for the rear seat passengers. Whilst the Velar gets an enormous boot, rear seat space, and for that matter rear head-room, I’m reliably (and repeatedly) informed, isn’t what you’d call generous. The leather seats are slippery too, apparently. And let’s not forget my passengers were sat behind me, all 5’ 7” of me. I’m glad I’m not 6’4”, my ears couldn’t take the beating. Up-front I can happily report, things are significantly more comfortable. Driver and passenger both get heated and cooled, and in some cases, massaging lofty-set seats, and a near cinematic view over the square-cornered bonnet. The steering is light and direct, the driving position multi-adjustable, and, the Velar will go virtually anywhere you point it – just like a Range Rover should. It will also tow 2.5 tonnes. The air suspension can be raised when tackling the rough stuff – not something I actually envisage many Velars ever doing – and generally the ride is good. Although, on the bigger wheels, ironically perhaps, broken tarmac and pot-holes make their presence very firmly felt. So far then, so Range Rover. Except that is for the switches that control it all. As a result of that ‘unwavering belief in reductionism’ there are virtually none at all. 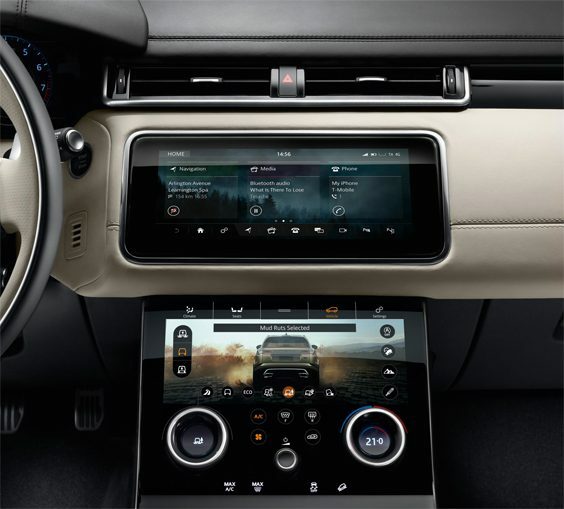 The Velar’s interior is dominated by two 10 inch touchscreens that control everything, from the Terrain Response System to the air-con, the radio to the seat heaters, and the sat-nav to the deployable tow-bar, plus everything in between. They look fantastic, and they’re beautifully clear. But, you have to take your eyes off the road – a lot – in order to operate them. Swipe from screen to screen and instantly your rotary heater control becomes the selector for Mud and Ruts, or Sand, or Snow. It’s all a bit distracting, and they’re sometimes a bit slow to react too. I was never quite sure if I’d switched the heated windscreen on or locked the diffs. Handy in an all-weather go anywhere vehicle. Also, there’s no Apple car-play. Just how will the suburbanites cope? And should one of the fuses blow… I’d much rather have a few more tactile buttons to be honest. Maybe I’m just a Luddite. I’ll admit, I like my Land Rovers chunky and very much clunky and I can’t wait to see what the new Defender is going to look like. Perhaps this one’s just a bit too smooth. Nevertheless, the Velar is very much the Range Rover to be seen in. Transmission: 8 speed auto, Four-wheel drive.